The King James Classic was extremely spread out across the Akron metro area which made planning out a schedule of games to watch a little difficult. I spent Saturday morning over at Kent State, a 30 minute drive from most of the 17s action, checking out some local talent and a few Michigan targets in the class of 2012. 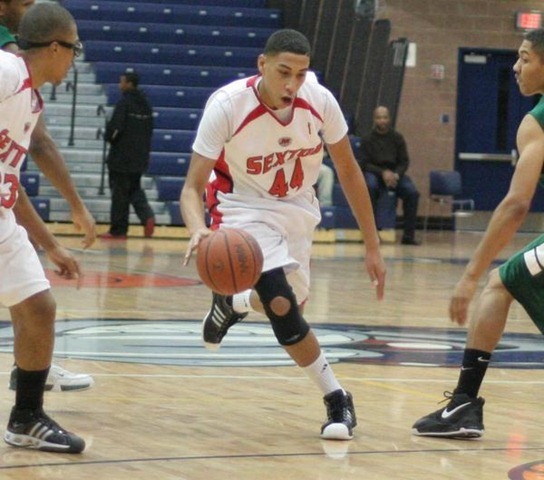 Denzel Valentine (Mustangs 16s, 6-foot-5): Valentine is an intriguing prospect, he’s got great size for a wing and is very strong. The problem for him going forward is that he isn’t quite quick enough to be an elite level player. He has great court vision but needs to work on his decision making. He forced the ball a few too many times and had way too many turnovers in the game that I saw. Valentine has the potential to be one of those wing players that does a little bit of everything and is definitely a prospect to watch. 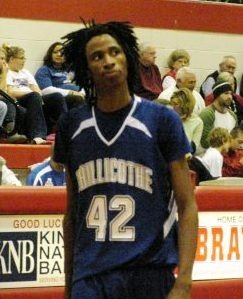 Malik London (Ohio Basketball Club 16s, 6-foot-8): London is extremely raw but his athleticism and length are obvious before he even gets in the layup line. When he was on the court he blocked a ton of shots and controlled the glass. His hands and offensive game aren’t there yet but he’s on the Michigan radar based on potential alone. London is hearing from Michigan among several other midwestern schools and made an unofficial visit to Ann Arbor last fall. Gary Harris (D3 Heat 16s, 6-foot-3, Video): Harris is a monster and anyone that has seen him play lately agrees. I wouldn’t be surprised to see Harris in 5 star territory when the national sites release their updated rankings for the class of 2012. He’s a jet quick guard that can get to the hole whenever he pleases. He’s also deadly in transition and shot the ball very well in the game that I watched. There’s not really much more to ask for, I would say Harris is the complete package. Lorenzo Cugini (Ohio Basketball Club 16s, 6-foot-6): When I watched OBC take on The Family’s 16U team Cugini filled up the scoring column. He’s listed at 6-foot-6 and he makes his living as a shooter, loving the pick and pop, but he is capable of scoring in other ways. After hitting a couple threes he also posted up his defender, picked up a couple hoops slashing to the hoop, and a couple garbage baskets crashing the glass. RJ Hunter (D3 Heat 16s, 6-foot-3): Hunter plays on Harris’ D3 Heat team and was the benefactor of Harris’ penetration several times. Hunter is a lights out shooter but he is also not necessarily a one dimensional player. He’s an intriguing prospect that is drawing attention from Michigan, Michigan State, and the rest of the Big Ten. Junior Lomamba (The Family 17s, 6-foot-4): Lomamba is a Wisconsin native but he is playing up with The Family’s 17U team. He hasn’t listed Michigan from what I’ve seen but I ended up watching him play quite a few games because he was running with Brundidge and Williams. The Family played him at the point and it was clear that he isn’t a true point guard but he made enough explosive plays to prove that he has big time potential. Anthony Clemmons (Mustangs 16s, 5-foot-10): Clemmons has the tools to be a very good lead guard and definitely showed flashes. He had a couple really strong takes to the basket but still has a ways to go. There are several strong point guards in Michigan’s 2012 class so it will be interesting to see where Clemmons shakes out. 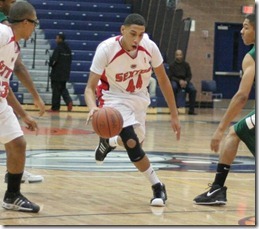 Marques Mondy (Mustangs 16s, 6-foot-4): Mondy shot and rebounded the ball very well for the Mustangs. He’s not as strong as Valentine but he played well enough to garner a mention in a close loss vs. Team Ferrari.